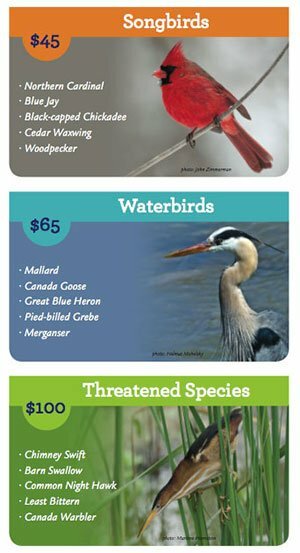 Spring is a busy time, not only for getting that much-needed spring cleaning done but also to prepare for the return of our feathered friends from their long migration. These birds have traveled far – some up to thousands of kilometers – and so what better way to greet them than by doing some preparation work that will make their return smooth. One of the most important things to know is when different species of birds return to your area. The best way to keep track of this is to write it on your calendar or keep a diary. You can also contact your local ornithology group or consult with us to see what species have already returned. 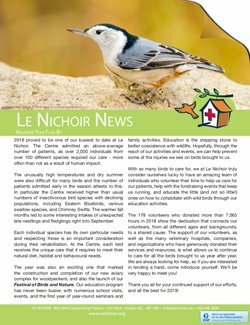 As we launch into 2016, staff, volunteers and friends of Le Nichoir share a look back on 2015. Both staff and volunteers care the birds admitted to Le Nichoir. Volunteers are very important to the Centre’s ability to offer bird care services 7 days a week, 52 weeks a year. In 2015, 138 volunteers gave over 4,600 hours of their time to help ensure compassionate and professional care for 1649 birds representing 100 species – an increase of 9.3% over the previous year. 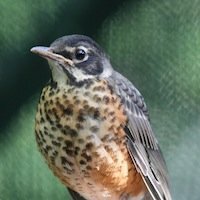 The 3 most common species of birds admitted to Le Nichoir in 2015 were species native to Quebec including the American Robin (13.8%), Mallard (12.4%) and Ring-billed Gull (8.5%). Cat attacks (8.2%) ranked as the number 1 confirmed injury while window collisions (3.8%) and car collisions (2.6%) came in second and third respectively. Moulting is the process of shedding something old to give way for something new. In birds, moulting involves replacing some or all their feathers at least once a year, usually in the fall. For many birds, this means having fresh feathers for the long migration ahead, the most dangerous time of the year for most birds. Blackpoll Warblers, for example, need perfect plumage to undertake their incredible migration and complete a non-stop 88-hour 3,000 km flight over the Atlantic Ocean. 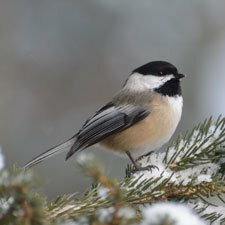 Some species such as the Cardinal or the Chickadee merely use the annual moult to refresh their plumage; the feather colours remain the same all year-round. Others, however, use the moult as an opportunity for change. Vibrant breeding colours are swapped for camouflage, either adapted to the winter conditions for those that stay, or for the long journey and winter habitats of migratory species. And that means going through a second moult in the spring, to regain the breeding colours. 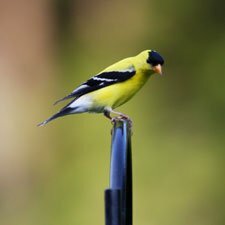 American Goldfinches are an example. The bright yellow male of summer is still at your feeders all winter; he’s just not yellow anymore but has assumed colours more like the female’s greyish green. Most warblers will do the same; the bright blues, oranges, yellows, stripes and patterns of the summer are exchanged for drab greens, olives and yellows that make most species appear very similar to one another. Many birds will have this pattern of being colourful in the summer and camouflaged in the winter. However, there are some exceptions. Ducks are a perfect example. Unlike most other birds which usually meet on the breeding grounds or are already mated, ducks usually bond in the winter and migrate back as a pair to the breeding grounds. It thus makes sense to have your best attire in the winter when it is time to impress the ladies. Have you ever noticed that there are no male duck to be seen in July and August? This is because Ducks moult their flight feathers in the summer and during this time they will have a hard time flying. Bright colours and flightlessness are not a good combination when there are predators around, so males ducks take on the drab appearance of the females during this dangerous time. While we revel in the beauty of their plumage and admire the magnificence of their flight, to really appreciate them it actually helps to understand how birds see the world around them. 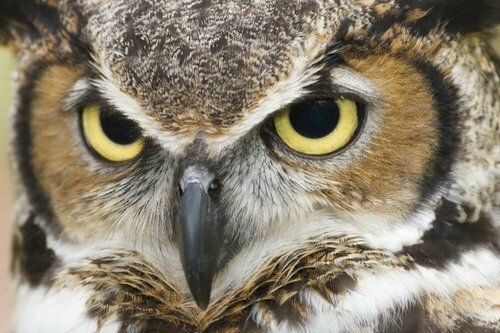 Their eyes’ focus, perspective and colour sense are finely-tuned adaptations needed to locate food, evade predators, and navigate through perils. Imagine you were looking for a new home. Wouldn’t it be great to be able to fly from one property to another, have a quick look around at the layout, décor and local amenities, and then have the owner beg you to move into the one you like best? That’s what it’s like being a bird! We’d all love to attract our feathered friends into our gardens, but they can be quite picky about what they expect from their surroundings. 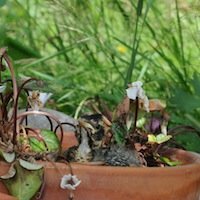 If the spring sunshine is spurring you to look at your garden and think about its design, keeping in mind the needs and desires of the birds you’d like to attract will help inspire your efforts. Early in July, we received a call from Auberge Zen (an animal shelter in Laval) about a “seagull” found entangled in fishing line, suspended in mid-air by its feet. With the help of the local Laval fire department, the bird was eventually detangled, and transported to Le Nichoir. 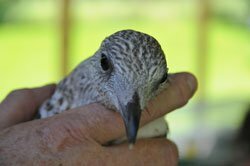 The preliminary examination showed that the juvenile ring-billed gull had no external injuries and had not suffered any dislocation from being suspended by its’ feet, with both legs responding positively to reflex tests. However, at this point the young bird was underweight and was still lying on its stomach with both of its legs extended backwards. It was questionable whether the gull would be able to recover use of both legs. 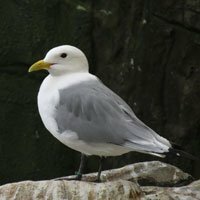 After being treated with anti-inflammatory medication, the gull was moved to the Quiet Room, where it could recover away from the public eye. To our surprise the next day, the ring-billed gull was standing upright on both legs and had eaten all of its’ fish! The bird maintained a healthy appetite and was walking in its’ carrier putting weight on both legs equally, showing no signs of discomfort. A week later, after a thorough re-evaluation, we moved the bird outside to one of our aquatic aviaries to monitor if it could cope walking in a larger area, and most importantly, if it could swim. There were three other ring-billed gulls of approximately the same age already in the aviary, and as soon as we opened the transport box, the gull jumped right out. It stretched and flapped out both of its wings, made small jumps across the aviary chattering to the other two birds the whole time. It eventually made its way to the pool, dove in head first, and paddled its way to the other side. In a few days, we noticed that the gull was flapping its’ wings. It was time for it to be released. The ring-billed gull was released on July 21st at Vaudreuil-sur-le-lac, Quebec with the help of our volunteers. Have you recently discovered a new tenant on your porch light or BBQ? In your flower pot or shed? 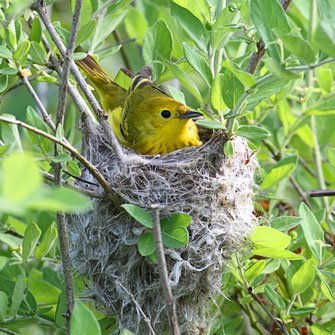 Some birds make nests in locations that are not considered ideal, because they create an inconvenience for us or a safety hazard for their young. 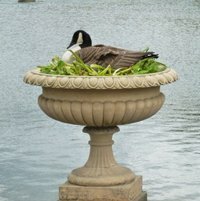 Different species of birds make nests of different sizes, at different times of the year and with different materials. For instance, American Robins are notorious for building their nests in awkward locations, such as on fences, mail boxes and even on a wreath hung on someone’s door! Usually, once a bird lays all of its eggs, the young will hatch within roughly 30 days. 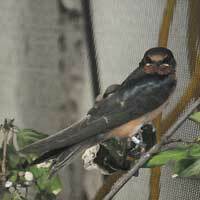 During this time it is best to avoid the nest area in order to reduce the chances of disturbing the parents, who run the risk of abandoning the nest. The nest should never be moved because there is a high risk that the parents will abandon the young. Once the baby birds hatch, they will spend about the first 30 days of their lives in the nest. During this period the parents will feed the birds constantly. Baby birds grow very fast, as they intend to leave the nest as soon as possible. Young birds in a nest run a much greater risk of being attacked by a predator. After about four weeks the baby birds—now fledglings—will jump out of the nest and stay on the ground for another one to two weeks before they can fly. This is a crucial time for them to learn about their environment and develop their flight muscles. It is therefore important to stay clear of the area so that the parents can continue to feed the birds and the fledglings do not disperse out of fright. In some cases, parent birds can come across as being aggressive when you approach the nest of babies or fledglings. They may fly in your direction or close to your head but will rarely touch you. This behaviour is nothing to be worried about and is only temporary, lasting two to three weeks. The parents are simply protecting their young. Still, it is best to avoid the area until the babies are gone. If this is not possible, then use an open umbrella while passing the area; this will scare the parents enough to stay away from you. Everything was better in the old days, the saying goes – including, it seems, our ability to spot a Barn Swallow or Chimney Swift up in the sky. 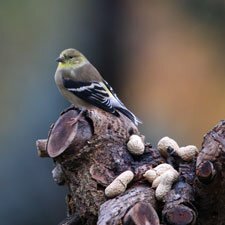 According to data collected by scientists, things really have changed: insectivorous bird and songbird populations have declined steadily in North America over the past decades. Swallows have suffered the steepest decline in population among all types of birds on the continent, with the Barn Swallow population down by 75% in the last 40 years, according to Wildlife Preservation Canada. The greatest decline, the organization says, has happened in the Maritimes. Every spring, Le Nichoir sees a spike in the arrival of young altricial birds to the Barn. Yet these baby birds don’t usually need help. “Most of the fledgling birds, including American crows, that we receive at this time of year are taken from their parents by people with good intentions,” says Susan Wylie, Le Nichoir’s executive director. People out for a stroll often believe these birds are injured or abandoned. Out of the 775 nestling and fledgling birds that were brought to Le Nichoir in 2012, about 588 were either unintentionally or intentionally taken from their parents, with the remaining birds admitted due to injury. Le Nichoir has been working to bring down that number. 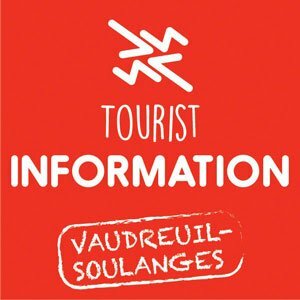 Nous les voyons partout : dans les parcs, les stationnements ou sur les plages. Les adultes ont un corps blanc et un manteau (le dos et le dessus des ailes) gris ou noir, alors que les jeunes sont tout tachetés de brun. Ils ont de longues ailes et des pattes palmées. Beaucoup les appellent ‘’mouettes’’, d’autres ‘’goélands’’, mais qui a raison ?